On the offense’s second possession of the game, redshirt-freshman corner Hunter Goetz caught a deflected pass off 2nd string quarterback Mason Cunningham. 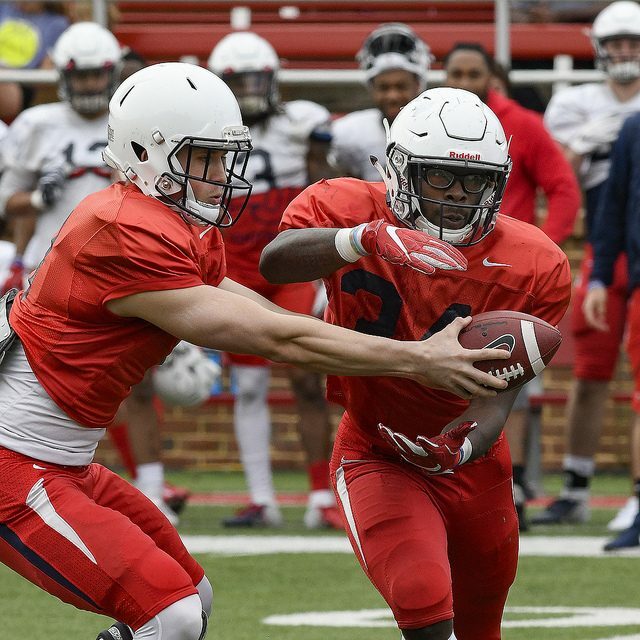 That set the tone for Coach Hugh Freeze’s first spring game at Liberty as the defense dominated the scrimmage for more than 3 quarters Saturday afternoon. The offense trailed 31-9 at halftime and 31-15 entering the 4th quarter, but they would find their rhythm and score three touchdowns in the final 7 minutes of the game to win, 38-34. The defense was spotted a 24-0 lead, and they carried a size-able lead deep into the 4th quarter, keeping the offense out of the end zone for the entire first half. Cunningham threw his 2nd interception of the afternoon, this one intercepted by Ceneca Espinoza who returned it 41 yards for a touchdown. The offense was short from several play-makers as receivers Antonio Gandy-Golden, Khaleb Coleman, and Noah Frith were all held out. Running back Peytton Pickett only saw action in the first half, taking his pads off in the 2nd quarter. Frankie Hickson continues to be held out of spring ball. With all the injuries at wide receiver, the quarterbacks favorite targets were Kevin Shaa and Damian King. King led with 7 receptions for 54 yards while Shaa finished with 6 receptions for 143 yards and a touchdown. 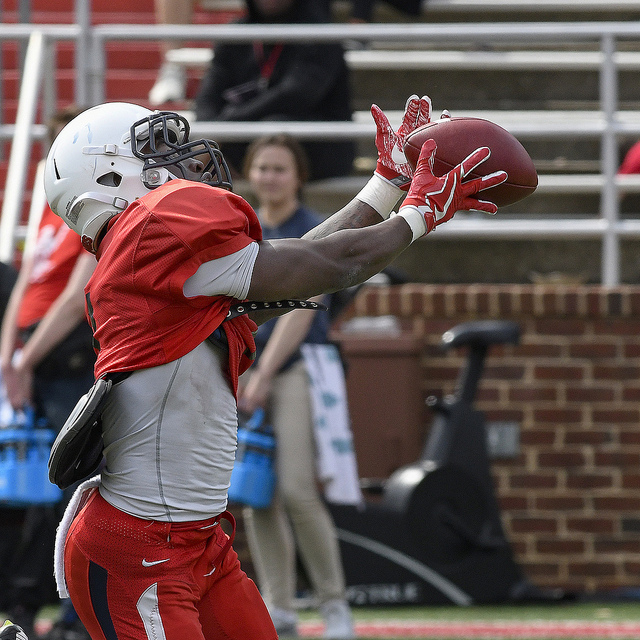 True freshman wide receiver Shedro Louis also made a big impact. The slot receiver had 5 catches for 134 yards and 1 touchdown. 3-star true freshman quarterback Johnathan Bennett got reps with the 2nd team offense, and he brought a spark to the stagnant offense. He was able to move the ball into plus territory each time he was behind center as 3 of his first 4 completions went for more than 20 yards including big gains to Shedro Louis and Johnny Huntley. He finished the game 9-of-15 passing for 186 yards and 1 touchdown. He was the first name out of Coach Freeze’s mouth when asked about he was pleased with on the offensive side of the ball today. Mason Cunningham, who is trying to hold Bennett off as Buckshot’s backup, finished just 1-of-5 passing for 3 yards and 2 interceptions. The first touchdown for the offense came with 52 seconds left in the 3rd quarter when 6th string running back Chandler Armstrong bounced around the left side for a 46-yard touchdown run. 5th string quarterback Henry Van Dellen was the signal caller for the drive. As the offense mounted the comeback, it was an end around pass from DJ Stubbs to Kevin Shaa for a 65-yard touchdown with 6:28 left in the game to bring the offense to within 31-25. Freeze joked after the game that perhaps Stubbs would be the team’s backup quarterback this season with as good of a pass as he made. Bennett would then connect with Louis for a 59 yard touchdown strike right down the middle of the field, and Frank Boyd would break free for a 57 yard touchdown run on the game’s final play. Boyd led all rushers with 12 carries for 108 yards and the one touchdown. Joshua Mack had 11 carries for 63 yards. Alex Probert finished 2-of-4 on his field goals, missing a 40-yarder and from 55 yards. The defense shined with 10 tackles for loss and 8 sacks in the first half. They would finish the game with 15 TFLs and 10 sacks led by Ralfs Rusins’ 3 sacks. New defensive coordinator Scott Symons’ unit also had 9 pass breakups and 4 quarterback hurries. Bejour Wilson led the defense with 6 tackles while Rusins also had 6 tackles to go along with his 3 sacks. Austin Lewis and Vincent Elefante each had 2 sacks. Remington Green also tied for the team lead in tackles with 6. 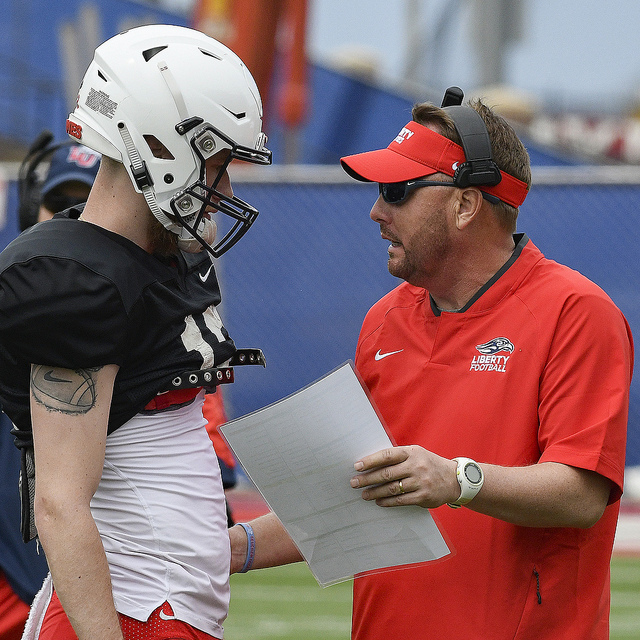 The Flames will conclude spring practice this week with two more practices as Coach Freeze and his staff continue to countdown towards kickoff against Syracuse to open the 2019 season. To Redshirt or Not to Redshirt Grant Jones?